What were you like in college? Usually high school gets all the attention, but what about those years when you were out of the house and “out on your own”? When all you really had to worry about was beer and noodle money? College was my modern rite of passage. I’m not sure how it is for other folks, if it was just an extension of high school, but for me, it was life-changing. Part of the reason was I had to learn a new culture. I was born and raised in Hawaii, and Hawaii’s culture is not the same as Mainland culture (the Continental US). Now, I realize that each state is unique, but Hawaii is decidedly different than Colorado. I fell in love with Colorado when I was about 13 years old. My family was living in California at the time, and we were taking a road trip to Iowa. When we drove through the mountains of Colorado, I remember looking at my surroundings in wonder and thinking, “I want to return here.” So, when it came to choosing a college, I knew where I wanted to go. Because this was before the widespread use of the Internet, I used a very basic and archaic program to generate a list of colleges and universities that fit my choices. For example, I wanted a small town and a good Anthropology program. It was exciting to look through the color brochures I received in the mail. College was something I looked forward to because high school seemed like a waste of time. Ultimately, I chose Fort Lewis College in Durango. It was a no-name school and probably still is. This isn’t to say that Fort Lewis, or as it was sometimes called Fort Leisure and Fort Loser, was not a smashing school. It was. The town was tiny, but packed with outdoor activities like hiking, hunting, skiing, water rafting, and rock climbing. All of which, I’m proud to say, I did. (Well, I got my hunting license, but didn’t kill anything, let alone hit the paper target.) For a high school graduate who had never stepped foot in Durango, I chose well. It was one of the best leap-before-you-look decisions I ever made. And since Durango was such a coveted place to live, it attracted quality professors. Looking back, I’m grateful I went to school out-of-state, even though it hurt the pocketbook, because the experiences of being out of my element were life-altering and turned my senses on to a sub-culture I had no idea existed. It was a complete immersion experience. I couldn’t even afford to go home, so I didn’t return to Hawaii for a visit for another 5 years. So, I was wet-behind-the-ears, green as could be, when I arrived on campus. There were Native Americans around for the first time in my young life. A university in Japan had a sister school exchange thingy with FLC so there were a few of them running around, but not enough to make me feel like I was at home, and I certainly wasn’t one of them. We didn’t hit it off, but we tried – and it was through the trying that we eventually became lifelong friends. This was one of those situations where because we were thrown together, we learned how surface differences didn’t run deep. She was a first generation American, like me. Her parents emigrated from Italy. Nadya, too, had a brother and we both came from working class families. Oh, and we bonded over rock music. She was more rock and roll though. I was a nerd compared to her, but without the smart and brainy qualities. Oh, never mind, that doesn’t really make me a nerd, but more like a dork. Yeah, I was a dork. And when I was first trying to make friends on campus, I somehow ended up in the nerd/dork crowd, but I knew I didn’t belong with them. I’m not sure for how long this lasted, maybe a trimester, before I found my peeps, but I no longer found an easy companionship with the theatre crowd like I did in high school. Socially, I was lost, but I was not lonely. I think because everything was new and different, I was too much immersed in the adventure to feel anything, but openness towards my college experience. And I have Nadya to thank for so much…a solid friendship is not to be forgotten. Unlike the jocks that failed and left our dormitory half empty, I loved academia life. There were so many fascinating courses to take and my education was a liberal one. For the first time in my schooling, I didn’t fall asleep, act naughty, or mentally check out. I eagerly took Astronomy, Ballroom Dancing, African history, Geology, Philosophy of Death and Dying, Art History, Sociology, Shakespeare, and Playwriting. I also didn’t have the problem that other students faced – I loved my major, Anthropology and Archaeology. College was the time when I got myself spiritually sorted out, if that makes any sense. I eventually made friends who came from similar backgrounds that helped me feel connected to a larger whole. I learned that whatever predetermined past I managed to survive was accepted and allowed to breathe among friends who cared and loved me. If high school was about theatre and drama, college was about nourishment and growing beyond my self. College was the stepping stone, the bridge that opened up to the greater world and the path that ultimately led me to a deeper understanding of myself and what I needed. What was your college experience? Was it your modern rite of passage? What were you like back then, and have you changed? Previous Post I’ve been discontinued. I went to college an hour away from my hometown, so it was like the thirteenth grade. My core group of friends changed a bit, but still consisted of people I knew from high school. I ended up getting my own dorm room my freshman year, so I didn’t even have one of those “getting to know someone out of necessity” experiences. I tried leaving my door open so people would talk to me but it made me panic, in a “OMG what if we have nothing in common and I have to be polite and pretend to be interested but you can tell because I just can’t lie and damn this is awkward” kind of way. So college didn’t really change me, I was just kind of in stasis until living abroad really opened me up to the world. But hey, I was an anthro major too! Funny how a lot of the bloggers I read are anthro geeks. If I had stayed in Hawaii, school would have been a short distance away, too. Although, I don’t know how many of my hs class stayed in-state. It felt like everyone was leaving when I had to stay behind and do my due diligence at community college. Another authentic, open, honest essay . . . thank you for sharing. Your openness is always refreshing. My college years, long ago, were totally life changing. Someone has to end up in the bottom percentiles even at an Ivy League school. No one thinks about that much, but people who have been on top have to learn a great deal of humility. That was me. I am in Denver this month house sitting for a friend. I walk his three dogs most days. The air is fresh and clean. The skies are deep blue and you would love the clouds here. Everything is manicured and green. Colorado, I do love it here. I tried to paste a photo for you but could not figure out how to insert it. Your memories and imagination is probably all you need. Our environments can either bring out the best in us or make the best in us run away. And of course, our surroundings can help us figure out what is truly important and shape us in new ways. I was a fool. I was a fool to believe that the certificate that I pursued would grant me the skills equal to any challenge. I fell in love with the academy and the belief that the world’s most intractable problems could be solved in the classroom. As David Zincavage said “(I) mistook narrowly focused expertise for intelligence” in both my professors and myself; that the academy promoted “certain kinds of intellectual ability almost entirely divorced from wisdom, integrity, and good judgment.” I had to strike out on my own, get a bit nicked up, for my own measure of each. I used to feel very sarcastic about my college degree, because it didn’t seem worth anything. These days, having a degree means even less, and for the generations that follow me, I feel sympathy for their plight. That being said, when I was writing this I realized that I did a lot of personal growing-up in college. And I’d rather academia be a place where we can talk about ideals rather than airing out grievances. I think classroom discussions should be pragmatic and ideal. Wonderful! I feel like I can’t yet talk about my experience since I’m still deeply immersed in it – I’d want to have a breather before assessing what college was for me, but I love hearing your story! High school was such a non-time for me as well that I think my college years will be what they were for you – a stepping stone to the next great epoch. Ahhhh, of course. Are you attending university in-state or out-of-state? Regardless, enjoy your time. It’s a unique bubble unto itself. I’m grateful for it. In state, fortunately, and I made friends quickly. It is a little odd for me as well since I don’t live on campus. A whole other bucket of worms. Yeah, I decided to live on-campus the whole time I was at FLC. Part of it was logistics, I didn’t have a car, and the campus is located on top of a mountain. Hitchhiking was common. I think as long as you are happy with your arrangement, on or off-campus doesn’t matter. Hmm.. undergraduate 4 years in English literature and languages were isolating. I was at a home university, then transferred to another university 120 k. away. It helped find define my identity more easily –away from parents. What else is new about this? There were very few Asians and black in my faculty at that time (late 1970’s-1980’s). I completed my degree at Canada’s 3rd largest university at that time. So it wasn’t tiny and it was well established in the humanities. My graduate degree, library sciences was a completely different experience because I had a few close friends who are still great friends..30+ years later. This has proven to be critical in supporting each other’s career/ job changes. The classes of course were smaller and demanded seminar presentations, fast turnaround assignments, etc. All those years were critical in self-definition, fostering independence, discovering what I truly enjoyed (some literary eras I hated/survived..etc.). I also realized that enjoyed what I learned from my mother’s home cooking, because that’s how prepared food … The familiar way is always the easiest way. And luckily for me, the healthy way. What became of your friends? You raise an interesting point. Large or small schools. 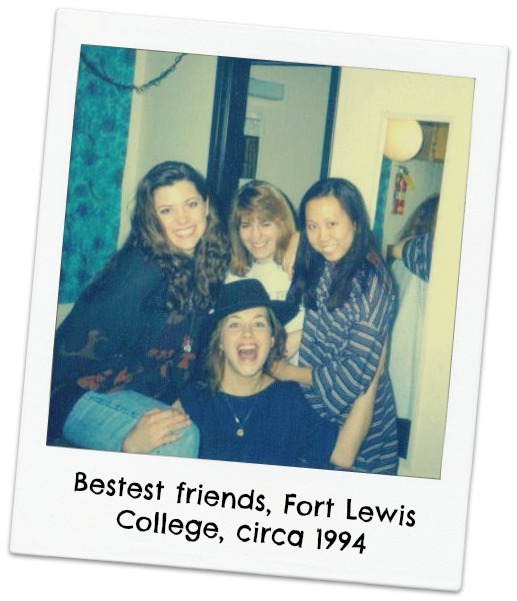 I wanted to go to a small school, so FLC was great for that as well. Big enough to feel like you could hide, and meet new folks and small enough to feel comfortable. Lovely campus. I’m in touch with my friends via FB. But I had kept in touch with mainly 2 of the girls despite feeling closer to the other one in college. None of us really pursued our majors (at least not for long!). How we ended up in the world (so far) was not how I expected it, to say the least! We (friends from university) don’t FB amongst each other. Email suits us to summarize at length. I think we gave each other courage to leave certain jobs, even physically move to completely different cities, driven partially for career-reasons away from jobs that we either outgrew or was evolving in an unhealthy situation later. As a result, none of us can retire early –so we simply do not follow the late boomer trend of early retirees after snaring a job for life. High school was useful but not something I reminisce or care a lot to revisit. It cemented my love for literature/writing and fine arts. I feel blessed to have such friends for both professional working and personal reasons. Hey Lani College 1981 (Ferris State College) was awesome for me in that I had a place to express fully any inhibitions…and honestly was pretty arrogant in the process…We had as many parties as we had classes each semester,and I found myself in the deans office on one of those occasions.. ( had many lessons to learn at that time).I stayed in state( In Michigan) for my Dental Hygiene degree and still use my degree to this day…I am grateful for all the challenges as well….met most of my friends long term after college…yet a few I keep in touch with. We lived in California when these two girls were in school, so she also has many new and old friends there. Just wanted to show that not all current graduates struggle for work..grateful for these girls finding there path leading them to excellent work they are happy with! There struggles would be more in not being defined by their work, yet balance it with personal time. Wow. Good for you and your girls. I know not everyone has struggled, but many of my friends have. I think financial success also has to do with what field you majored in, too. Crushing student loan debt is also something my generation and younger have to deal with…I’d be curious to know if students are majoring less and less in the arts and humanities b/c of our economic crisis. Preach it, sister! Your girls did it right, and I’d be proud, too. Socially, I felt very much out of place in college, or university, as what we call it here in Australia. I only stuck around a few people of Asian ethnicity who were in my course throughout my degree. We met in our first semester and though we are not best buds or super close, with still keep in touch today. Yeah, I don’t see college or uni for “preparing students for the workplace”. I guess that is why I’m a teacher in Thailand. 😛 I did work as an archaeologist, but I knew I would have to get a higher degree to make any real money and it lacked creativity. Anthro (at least at the time) seemed hell-bent on being “taken seriously” so there wasn’t any room for personal expression. Looking back, I see college as learning about a variety of worldviews and disciplines – that whole “expanding your mind” bit. I think for those who want to make a lot of money or have a “good job” – trade schools are perfect for that. I wish I was passionate about something that made money, but I’m not. I’m sorry you felt out of place socially. Were you treated poorly? Or did you just feel different? Yeah, I didn’t really party in college either (or ever, really). A little, but not super crazy like some folks. Do you still feel socially out of place in Australia? I don’t remember being treated poorly all the time. One part of me was overwhelmed at becoming independent at college – making my own money, paying for my own food etc. The other part of me didn’t like how “happening” most college students are – the partying, activity clubs and so on. I couldn’t find a place to fit in and kept to myself. But looking back, I didn’t mind. Today, I am happy being myself and have learnt that a small circle of close friends is much more valuable than being a part of a large social crowd. I was a student who got all kinds of grades, and I do mean ALL. Very high grades, high enough grades, passing grades, some “INCOMPLETE” ones, some failed ones. I don’t know. Sometimes, no matter how hard I tried, Math subjects and Chemistry and I didn’t mix, know what I mean? Meanwhile, I excelled in other subjects even without trying much. It was still a pretty much boring life until I became a student journalist, then I helped found the very first chapter of a university film organization, then I became a college radio DJ, then I helped found its exclusive student organization. If it weren’t for those things, college would have been pretty boring all throughout (well, except for some subjects I liked). Radio DJ, film organizer, and student journalist!!! You were too cool for school! Hahhahaha. Very interesting – barbarian. What? Ug. Sororities. Don’t get me started. Luckily, I chose a school that didn’t have a Greek system. They seem so degrading. Well, not really film organizer, though part of our activities involved holding free film showings. I was active for a while until DJ-ing made me busy, which became a sort of therapy for me. We were experiencing a family crisis, what with my father suffering a mild stroke and needing to stop work due to his short-term memory loss. Basically, his personality changed from that of a 40+ guy to that of someone who acted and thought more like my age then, maybe even a bit younger. It was a challenge to suddenly “have” a brother and “lose” a father. I was a Daddy’s Girl, in a way, after all. That’s really heavy. I’m so sorry. Music sounded like it was the perfect therapy, for sure.You sure have experienced a lot for such a young lady! LOL!!! Not sure how young is young to you, but I’m not so young anymore, he he. That’s wishful thinking on my part 😉 But yes, back then, I was still young. When I think about my experiences since I was small, sometimes I wonder how I coped well enough. The worst I’ve experienced so far (and hopefully the last) was just two years ago when I lost both my parents. But c’est la vie, and I’m just glad their suffering is over. I’m willing to wager you’re younger than me!!! I’ve already lost my dad, not looking forward to anything happening to my mom. I am sorry, dear. Thanks. Hope your mom lives for lots more of fruitful years!